The country, the most southerly of the West Indian island states is situated 11.2 km off the Venezuelan coast. 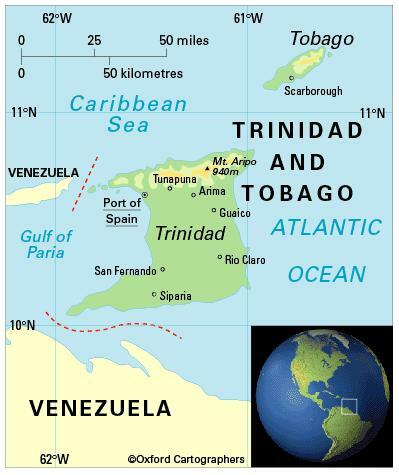 It consists of two islands: Trinidad and Tobago. Tropical, tempered by north-east trade winds, with a temperature range of 22-31°C and an average annual rainfall of 1,631 mm. The dry season is January to May and the wet season June to December, with a short dry sunny season called the Petit Careme during September and October. The most significant environmental issues are water pollution from agricultural chemicals, industrial wastes and raw sewage; oil pollution of beaches; deforestation; and soil erosion. 1,337,000 (2012); of which some 54,000 live on Tobago; 14 per cent of people live in urban areas. The population growth rates stood at 0.4 per cent p.a. between the years of 1990 and 2012. In 2012 the birth rate was 15 per 1,000 people (27 in 1970) and life expectancy was 70 years (66 in 1970). The population is about 40 per cent Indian, 38 per cent African and 21 per cent mixed descent, with smaller numbers of people of European, Latin American and Chinese descent (2000 census). Trinidad and Tobago is classified as a high-income economy by the World Bank.